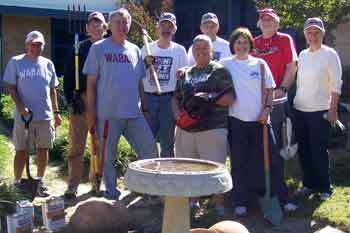 The Dallas area Wabash alums worked project for the second consecutive year caring and helping with the maintenance of "Cheryl's Garden of Learning" at John R. Good Elementary School in Irving, TX. Mike's wife Jensy is a kindergarten teacher there, and she also has assumed responsibility for the garden, an outdoor classroom. We sanded and stained 4 new picnic tables purchased in part with contributions from Wabash men, weeded and trimmed back local flora, replaced a broken water feature with a bird bath, and created a permanent location for a bird house. Afterwards, we gathered at Sonny Bryan's, a local barbecue place, for lunch and good fellowship.